In the United States low back pain is ranked number five among the most common reasons for physician office visits. Of the patients who get medical care, they usually improve rapidly in the first month. However, up to one-third of patients report chronic back pain of at least moderate severity. Many diagnostic tests and treatments have been tried for low back pain. Many things may be suggested, but have little evidence to show their worth. Diagnostic tests and treatments for low back pain can also be costly. In 1998, it is estimated that 26.3 million dollars were spent in the U.S. On health care for low back pain. What to do about back pain can be confusing for both you and your provider. The American College of Physicians (ACP) and the American Pain Society (APS) recently had a panel review and analyzed available research on acute and chronic low back pain in adults. The panel's recommendations were considered proven only when they were supported by at least fair-quality evidence. They also had to have at least moderate benefits. Some were considered proven even with small benefits if there were no significant harms, costs, or burdens. This guide will give you a general overview of the newly recommended guidelines for the evaluation, diagnosis, and treatment of acute and chronic low back pain in adults. The most common category is non-specific back pain. This means that the cause of the pain is unknown. More than 85% of patients evaluated in the primary care setting with low back pain have non-specific low back pain. This means there are no findings of a specific disease or spinal abnormality. Another category is back pain with leg pain. Leg pain is called radiculopathy or sciatica. This may be caused by a problem with a disc between the bones of the spine. Discs may be torn (annular tear), bulged (protruded), or ruptured (herniated). Leg pain can also be caused by stenosis. Stenosis happens when the hollowed out portion of the bones of the spine become narrowed. The spinal cord lies in the hollowed out portion. When it becomes narrow, the spinal cord can become pinched. Stenosis can also happen when there is narrowing of the opening for the nerve root. The nerve root branches off the spinal cord. 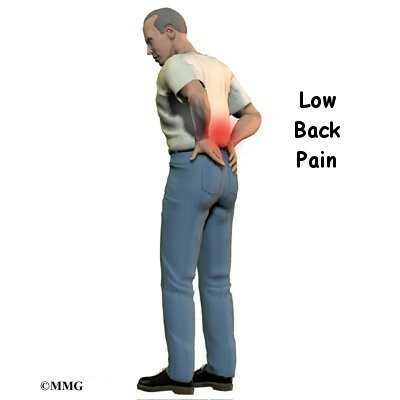 Other specific spinal causes of low back pain include fracture, infection, tumor, cancer, and inflammatory arthritis. Spinal cord and nerve function can be evaluated in several ways. Straight leg raise (SLR) test is when your doctor lifts your leg up while the knee is kept straight. This can be useful in diagnosing a herniated disc. Your doctor will want to check the strength of various muscles in the legs. Reflexes at the knees and ankles should be evaluated also. Sensation of the leg also evaluates nerve function. Other signs that there may be a neurologic problem include loss of bowel or bladder function. Your doctor will ask questions about the possibility of low back pain that comes from problems outside the back. Sometimes pain is from the pancreas, kidneys, or bulging of the large blood vessel in the abdomen called the aorta. Your doctor will also want to know about risk factors for cancer and infection. Your doctor will ask about any problems with your mood, stress, or problems at home or on the job. Psychosocial factors are known to make your back pain worse, or interfere with your back pain getting better. These include depression, passive coping strategies, job dissatisfaction, disputed compensation claims, and being overly focused on physical symptoms. These problems can predict the course of low back pain even more so than findings on the physical exam, or the severity of your pain. There is no evidence that routine plain x-rays in patients with nonspecific low back pain improve patient outcomes. They subject you to a significant amount of radiation. The amount of radiation to reproductive (sperm and egg) cells from two views of the lumbar spine is equivalent to being exposed to a daily chest x-ray for more than one year. Plain x-rays are recommended when there is the possibility of compression fracture of the vertebra bone. High-risk patients are those with a history of osteoporosis or steroid use. Your doctor may want you to have imaging when nonspecific low back pain (without symptoms of radiculopathy or spinal stenosis) becomes persistent (lasting more than four to eight weeks). There is no optimal evidence to make a recommendation as to which imaging study is most useful in this case. Neurologic deficits or the suspicion of a serious underlying condition such as cancer or infection merit a prompt work-up with Magnetic Resonance Imaging (MRI) or Computed Tomography (CT). Delayed diagnosis is linked to worse outcomes. MRI allows your doctor to look at slices of the area in question. The MRI machine uses magnetic waves, not x-rays to show the soft tissues of the body. This includes the spinal cord, nerves, and discs. It can also evaluate spinal bones. The test may require that a dye be injected intravenously (through a vein). CT scans are a form of x-ray. MRIs are generally preferred over CTs since it does not use radiation. If you have risk factors for cancer, the recommendations are for either x-rays, blood work to measure erythrocyte sedimentation rate (ESR), or an MRI. Most patients with lumbar disc herniations with radiculopathy improve with noninvasive therapy (treatments other than spinal injections or surgery) within the first four weeks. If symptoms of radiculopathy become persistent after noninvasive therapies, the panel recommends surgical removal of the disc or epidural steroid injections as possible treatment options. Surgery is also a treatment option for spinal stenosis with persistent symptoms. Your doctor should inform you that an acute episode of low back pain with or without radiculopathy or sciatica should more than likely improve in the first month. The evidence shows that staying active is more effective than resting in bed. Return to normal activities as soon as possible should be encouraged. Self-care education books are inexpensive and have shown to be helpful. Their benefits are similar to costlier therapies such as supervised exercise, acupuncture, massage, and spinal manipulation. The panel authors did not find sufficient evidence to guide specific recommendations about modified work on the job. Factors to consider are your age, general health, and physical demands of your required job tasks. Use of heating pads may provide short-term relief of acute low back pain. There is not adequate evidence to recommend lumbar supports and cold packs. Medications from several classes have been shown to have moderate, mostly short-term benefits for patients with low back pain. Acetaminophen (TylenolÂ®) is a slightly weaker pain medication than non-steroidal anti-inflammatories (NSAIDs). However, acetaminophen is generally safer and less costly. Acetaminophen can cause liver enzyme elevations at dosages of 4 g (4,000 mg)/day even in healthy adults. The clinical significance of the liver enzyme elevation is uncertain. NSAIDs can be selective, or non-selective. AdvilÂ® and MotrinÂ® (ibuprofen); and AleveÂ® (naproxen) are examples of over-the-counter non-selective NSAIDs. CelebrexÂ® is the only selective NSAID available in the United States. Nonselective NSAIDs, while more effective than acetaminophen, are known to cause stomach and kidney problems. Selective NSAIDs such as CelebrexÂ® and most non-selective NSAIDS also increase risk for heart attack. The lowest effective doses for the shortest periods necessary are recommended. If you benefit from nonselective NSAIDs, taking a medication to protect the stomach lining may be beneficial and more cost-effective than a selective NSAID. It was also recommended that doctors remain alert for new evidence about the safety of NSAIDs. There is not enough evidence to recommend for or against aspirin to treat low back pain. When used carefully opioid analgesics (Tramadol) are an option in the management of acute or chronic severe, disabling low back pain. Potential risks such as addiction and abuse should be considered before starting them. There is not enough evidence to recommend one opioid over another. Skeletal muscle relaxants may provide short term relief of acute low back pain. There is no convincing evidence that skeletal muscle relaxants differ in effectiveness or safety. Sedation can be a problem with any of the muscle relaxants. Tricyclic antidepressants such as PamelorÂ® have demonstrated effectiveness in the management of chronic low back pain. Selective serotonin reuptake inhibitors (SSRIs) such as ProzacÂ®, ZoloftÂ®, CelexaÂ® and LexaproÂ®, and trazodone have not shown that they are effective for low back pain. Serotonin-norepinephrine reuptake inhibitors (SNRIs) have not yet been evaluated for low back pain. Since depression is common in patients with chronic low back pain, it should be properly treated. Small, short-term benefits for the treatment of leg pain or radiculopathy have been found with gabapentin (NeurontinÂ®). There is not adequate evidence to recommend for or against other similar drugs for radiculopathy. Benzodiazepines such as ValiumÂ® (diazepam) provide short-term pain relief for acute or chronic low back pain. However, they can be abused, cause addiction, and require more of them to get the same result. When benzodiazepines are used, a time-limited course is recommended. Herbal therapies including devil's claw, willow bark, and capsicum seem to be safe options for acute exacerbations of chronic low back pain. Systemic corticosteroids have not been shown to be helpful in the treatment of low back pain with or without sciatica. Overall, evidence is limited on the benefits and risks when medications are used long-term for low back pain. Spinal manipulation may provide small to moderate short-term benefits for acute low back pain. Supervised exercise therapy, home exercise regimens, and other non-medication treatments have not been proven to be effective for acute low back pain. For subacute low back pain (lasting four to eight weeks), intensive interdisciplinary rehabilitation is moderately effective. This usually includes the services of a physician, psychologist, physical therapist, social worker, or vocational counselor. Active physical therapy to restore function and a form of psychological treatment called cognitive-behavioral therapy (CBT) are shown to reduce time off work due to low back pain. For chronic low back pain there are non-medication treatments with fair to good supporting evidence and moderate benefit. These include acupuncture, massage therapy, and Viniyoga-style yoga. Exercise therapy has also shown fair to good supporting evidence. This includes individualized, supervised stretching, and strengthening therapy. Cognitive-behavioral therapy (CBT) or progressive relaxation, spinal manipulation, and intensive interdisciplinary rehabilitation have also shown moderate benefit. Short-term benefits may be obtained with back schools, but the evidence is inconsistent. Transcutaneous electrical nerve stimulation (TENS) and intermittent or continuous traction have not been proven effective for chronic low back pain. There is insufficient evidence to recommend interferential therapy, low-level laser, shortwave diathermy, or ultrasound for chronic low back pain. Lastly, the panel recommends that patient expectations of benefit from a treatment be considered when choosing therapies. They found that this seems to positively influence outcomes. 1. Chou R, Qaseem A, Snow V, et al. Diagnosis and treatment of low back pain: A joint clinical practice guideline from the American College of Physicians and the American Pain Society. Annals of Internal Medicine 2007. Vol. 147, No. 7. Pp. 478â491.